As a speaker you are responsible for being at an event and making a presentation at the right time, on the right day on the right subject. That’s something you can do with planning. Because time planning for presenters is a priority. So to help out, we have five pointers for how to manage your time as a presenter. First of all, you have time to plan. You must give yourself the time to plan your presentation. Don’t be rushed. You might need several days, or perhaps weeks to get your presentation just right. Next you want to plan for the time available. If it’s a 10 minute presentation, then aim for a 10 minute presentation. Also remember your time allowance for questions. Sound timekeeping is essential. So, if your audience expects a 10 minute presentation, then deliver it. Whether it’s a Board room PowerPoint presentation, an agency pitch or a conference room address you owe it to the organisers and the audience to start and finish on time. There are exceptions, of course. We have a case study, in the blog of a Baroness Scotland speech where she missed her timings. This shouldn’t be problematic, since you have already rehearsed, and dress rehearsed. You know your lines and you know the subject. And, you aim to hit the right time, 10 minutes for example. So, then you must actually, run to time. Keep the flow going, keep up and hit the time marker. Of course you could always rely on technology such as a PowerPoint presentation add-in. But I’d suggest practice is best. Here are all the time management pointers in summary. You’ve ticked off the first three in the list. So, what’s next? The next challenge is typically when you start late because of an untoward delay earlier in the event. If an earlier speaker over runs their allotted time or, if the Board room discussion goes on longer than planned. In such circumstances you have to speak with the organisers very smartly. You have to know your options. So, will lunch be delayed by 15 minutes, if you stick to time? Or, should you run for 25 minutes and not the planned 40 minutes? Alternatively, does the organiser want you to make up time? You should consider all these scenarios. And if the organiser wants you to save some time, then you have to be prepared to do so. And then aim to do so without losing the purpose of your presentation. If you have an acceptance speech and you have only seconds available, then you need to be ready. It’s a raw situation. But it’s a situation that is replayed every day somewhere in the UK. Your content editing skills might need to be used very quickly. This is presentation planning quick time. As a last note you have to consider the scenario where the organiser asks you to fill a conference agenda for longer than initially planned. This might not seem as arduous as it first appears. However, you should always plan for tangent time. This is the time that you feel can be given over to explore some content in more detail. That is, if you sense that the audience requires it. If your content clearly works with the audience you might have the opportunity to go into more detail than you had previously anticipated. So if you have some tangent time prepared then you should be able to work this into your main presentation. Thus you meet the organiser’s needs. Time planning for presenters is key, and these five pointers should help with your next presentation. 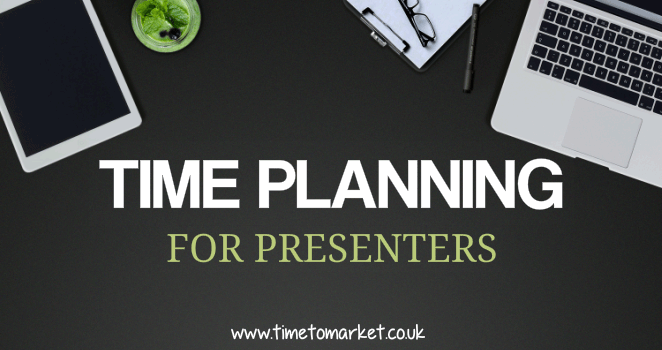 You can learn more about time planning for presenters on a PresentPerfectTM training course.